On Sale Now! 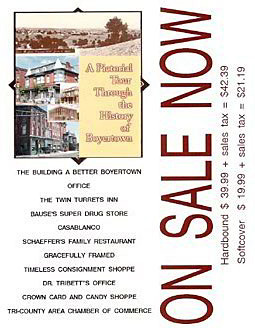 Building a Better Boyertown's Pictorial Tour Through the History of Boyertown, released October 23, 2006, offers lovers of Boyertown a glimpse into the past .Books are available in assorted locations around Boyertown..
Rufus Erb snaps a photograph of "Book-ish." 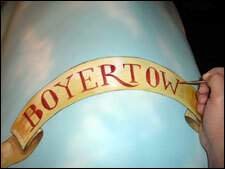 Through the History of Boyertown. 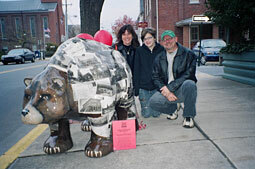 appearance with artists Diane, Chris, and Kaitlin Dietz on October 23, 2006, the debut of Building a Better Boyertown's book Pictorial Tour Through the History of Boyertown. Daughter Aleah contributed to the artistry of the bear but was not available for the family photograph. Gary and Denise Christman. 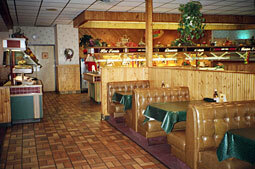 Denise owns and manages Bonanza Restaurant, co-sponsor for Book-ish. 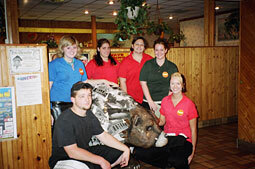 Visit the bear and co-sponsor Denise Christman inside Bonanza Restaurant and offer a name for him or her. by Ed Luterior known as The Fishpainter. 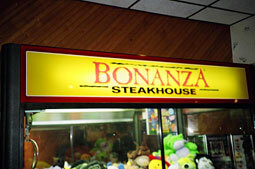 The Bonanza Bear had several creators. 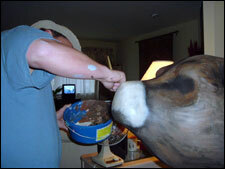 The face and feet were painted by Ed Luteria, known as The Fishpainter. 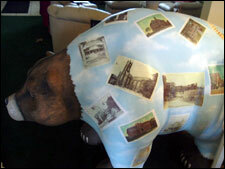 Ed began the decoupage process for the debut of the Bear Fever bears in May 2005. 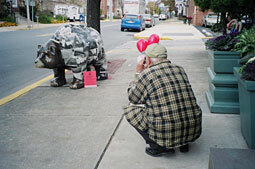 He was featured in the TriCounty Chamber's booklet titled “ Boyertown , Pennsylvania , A Special Kind of Place” published in the summer of 2006. 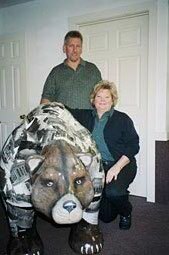 The inspiration for the bear came from Chris' restaurant, CD's Place - affectionately known as "The Cup" - which is located at 237 N. Reading Ave. in Boyertown. He and Diane did the counters and tables in a similar style using copies of their album collection and concert ticket stubs. Aleah, who did some of the painting on the bear, painted the "mural of musicians" in the restaurant. She has also been commissioned to do custom murals in people's homes. Kaitlin, who also helped on the project, designed the menu covers for CD's Place and is also interested in art. 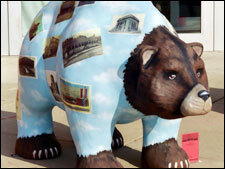 Visit Bonanza Bear for a collage of Boyertown history. 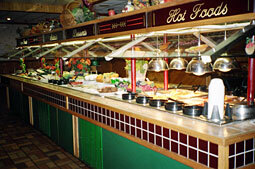 Stop in at CD's Place for great food, a musical experience, and a glimpse into the artistry of the Dietz family. Great things can happen when we let our creativity flow.